Season 10 Buffy & Angel Variant Exclusives from Dark Horse at WonderCon – This Weekend Only – April 18-20! 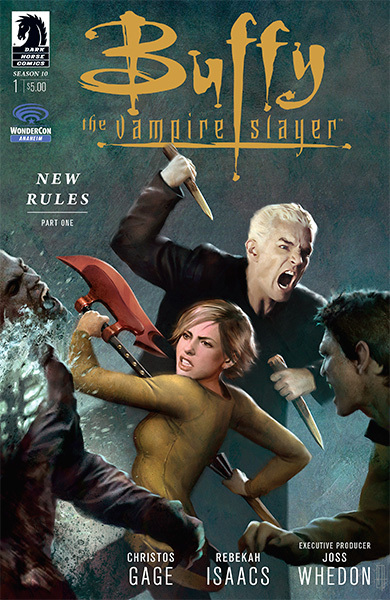 The first issue of Buffy the Vampire Slayer Season 10, has a new cover from Tomb Raider art director Brian Horton, depicting a very realistic likeness of our favorite platinum blonde vamp, Spike (played by James Marsters), in mid-strike. Additonally, the Angel & Faith Season 10 #1 variant cover by artist Steve Morris, will also be unveiled at WonderCon, featuring a rather sultry Faith. These gorgeous editions are a must for the Buffy or Angel fan and each copy will be selling for $5 (only five copies per person). There’s a limited run of 1,000 copies (for each cover) that have been produced, so get them while they’re hot at WonderCon. WonderCon starts tomorrow, Friday, April 18th and runs through Sunday, April 20th, at the Anaheim Convention Center. For more information on WonderCon, visit https://secure.comic-con.org/wca. For more on the Buffyverse, check out my reviews on Season 10 of Buffy the Vampire Slayer and Season 10 of Angel & Faith. Ever since Barnabas Collins bared his fangs for the 1960’s Gothic daytime soap opera, Dark Shadows, we’ve been enamored with repentant vampires. The idea of the ultimate bad-boy-turned-good by the love of a woman, captured our dark hearts. Like Barnabas, the path to true love never did run smooth for fellow repentant vampire Angel (created by Executive Producer Joss Whedon), and of course, there’s a twist to that epic love story as well. For those who are unfamiliar with the tale, Angel is a vampire cursed with a soul (in the Buffyverse vampires do not have souls, as a rule, with only two exceptions) by a group of vengeance-seeking gypsies, for the atrocities he has committed. Now, feeling the full weight of the devastation he has wrought, Angel (once the worst of his vampire-kind – known then as Angelus / Liam – when he was human – who wasn’t that much better), seeks redemption for his sins. When we first meet Angel (played by David Boreanaz – Bones) in the TV series Buffy the Vampire Slayer, he is watching over Buffy (Sarah Michelle Gellar). OK, he comes off like a creepy stalker whose motives are unclear at first, but he means well. Eventually, he joins Buffy and her friends in the fight against evil. Unfortunately, Angel makes the mistake of falling in love with the young slayer. In a moment of unbridled passion, Angel loses his soul again (part of the gypsy curse). A moment of true happiness turns Angel back into a soulless, heartless, mass-murdering monster. Once his soul is restored, Angel knows he can’t stay with Buffy, as he can’t risk the demon within returning to destroy her and all those around her. The star-crossed lovers must part. Heartbroken, Angel removes himself from Buffy’s life and relocates to Los Angeles (the City of Angels – where else?) where he sets up Angel Investigations – a detective agency with a mission to protect the weak and the helpless. Along the way, Angel meets Doyle (played by the late Glenn Quinn – Roseanne), a half-human half-Brachen demon, whose painful psychic visions aid Angel on his mission. By chance he also re-meets friend and former mean girl Cordelia Chase (Charisma Carpenter – Veronica Mars), trying to make it big in Hollywood as an actress. Later, Angel is joined by disgraced Watcher Wesley Wyndam-Pryce (Alexis Denishof – How I Met Your Mother, Grimm), former-gang-member-turned-slayer Charles Gunn (J. August Richards – Arrow, Agents of S.H.I.E.L.D. ), super science geek Winifred ‘Fred’ Burkle (Amy Acker – Dollhouse, Person of Interest), and the green, karaoke-loving, telepathic demon Lorne (played by the late Andy Hallett). When the TV series ended in 2004 (in the finale Not Fade Away), we were left with the cliffhanger to end all cliffhangers. Angel, along with fellow vamp Spike (James Marsters), Gunn and Illyria (the Demon taking up residence in Fred’s body), were left with Hell literally raining down upon them — a parting gift from the Senior Partners from the evil law firm of Wolfram and Hart (The Wolf, The Ram and The Heart). With an army of demons bearing down upon them, a dragon flying overhead, the loss of their friend, Wesley, and Gunn wounded, our four heroes stand, seriously outnumbered. The last thing we see is Angel, leading the charge. That image burned into our retinas. We were left staring blankly at the screen in disbelief. This couldn’t be the end, could it? I hadn’t been this upset by a series finale since the last episode of Blake’s 7… but I digress… as I often do. Sadly, we never saw Angel and company grace our screens again. 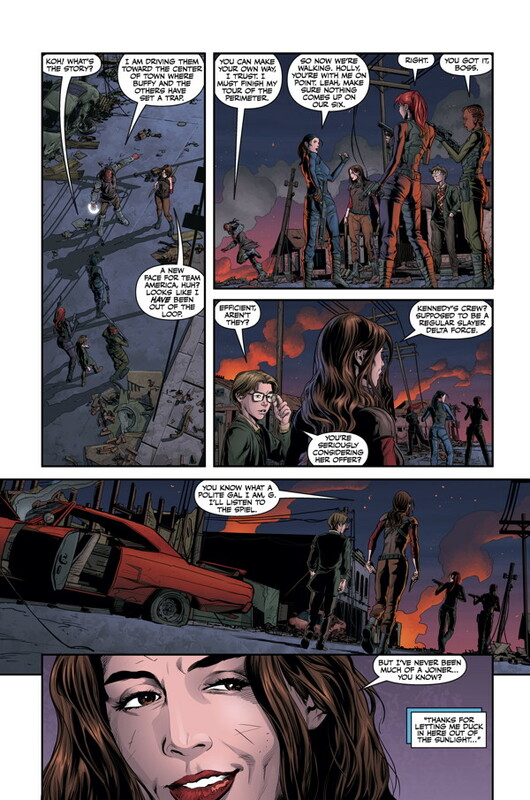 Joss Whedon resurrected Angel in 2007 (then with comics from IDW Publishing) picking up where the TV finale left off. 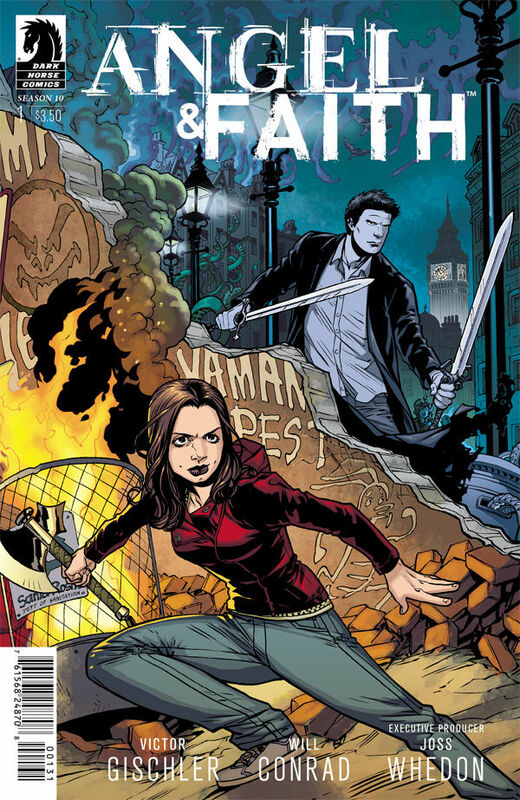 For the last two seasons, Joss and Dark Horse Comics have teamed Angel up with Faith the Vampire Slayer (played by Eliza Dushku in the series) to continue their adventures. Faith has come back from the brink herself, and in her own way, is also seeking redemption for her sins. Both lonely souls bond, becoming allies and friends. Season 9 of Angel & Faith saw the return of Rupert Giles, Buffy’s Watcher (played in the series by Anthony Stewart Head). Angel had killed Giles while under the influence of magic in Season 8 of Buffy the Vampire Slayer. However, there was an unforeseen consequence to resurrecting our beloved Giles (formerly a middle-aged Englishman). When he returns, he comes back as a young, almost Harry Potteresque pre-teen, capable of wielding magic himself. As we have learned, magic can be unpredictable and dangerous at times. Welcoming Giles back to the world of the living comes with a steep price. Part of London is sacrificed in order to do it and now part of the city is flooded with magic and overrun with supernatural beings. When we return, we find our brooding hero, Angel, attempting to deal with the fallout from the previous season, in the section of London known as Magic Town. As you can imagine, there’s plenty of brooding and self-recrimination that comes with that territory. Meanwhile, we transition over to Faith, who has joined Buffy and the Scoobies in Santa Rosita to help fight the dreaded “zompires” (zombie vampires), as we saw in the Season 10 opener of Buffy. Faith also delivers her comrades the greatest of all gifts in the form of a youthful Giles, though it pains her greatly to do so as she watches the joyful reunion from the distance, always the outsider. 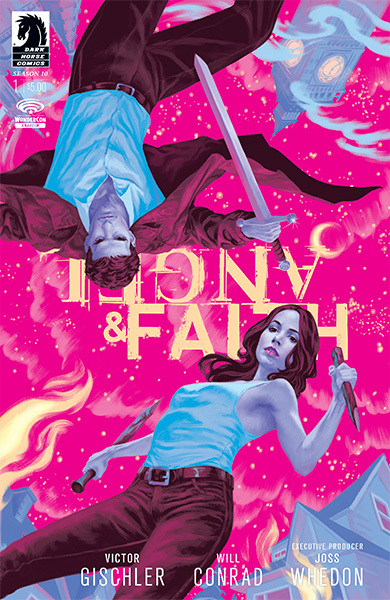 For Season 10 of Angel & Faith, Victor Gischler and Will Conrad take the helm from the creative team of Christos Gage and Rebekah Isaacs (who have moved over to the main Buffy comic) and with them they bring an intense, dark flavor that suits this series quite well. Far less colorful and light-hearted in tone than Buffy, Gischler and Conrad match the look and feel of the Angel TV series. Will Conrad’s artwork captures the likenesses of the actors from the show (especially Boreanaz and Dushku) beautifully, and that alone had me hooked. The story itself is fast-paced, with plenty of tension and drama. Though I found the transitions between Angel’s scenes and Faith’s a bit jarring, I blew through the issue quickly, and found myself disappointed when it was over so soon. The skilled team of Gischler and Conrad hit the opening issue out of the ballpark and left me wanting more. As a fan of the series, what more can you ask for? 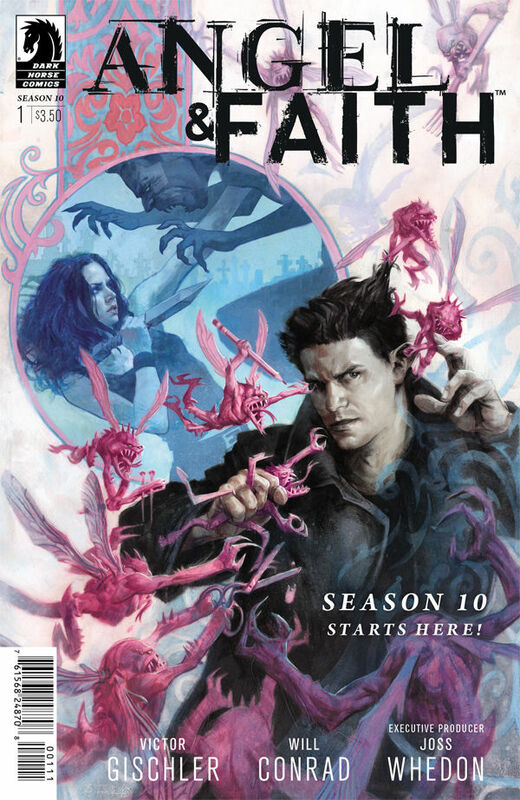 Angel & Faith Season 10 Issue 1 from Dark Horse Comics is out today at a comic book store near you.